AMPY is a green way to gain some extra backup for flat or nearly dead batteries. It harnesses the energy you create when moving and converts it to usable power. Put it on your leg while exercising or toss it in your bag while you’re out and about. For the best results, charge AMPY in the wall and then maintain the charge with daily activity. 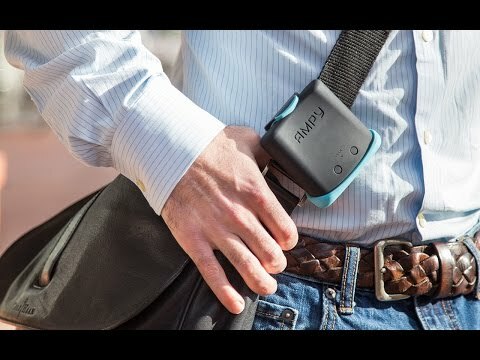 Dimensions: 3.3" x 3.3" x 1.3"
AMPY is a wearable motion charger—this kinetic energy battery turns your movements into power. The more vigorous your activity, the more energy you will generate. It’s a green way to get some extra backup for flat or nearly dead batteries. Three friends pursing their engineering PhDs created AMPY. Founders Tejas Shastry, Mike Geier, and Alex Smith thought about how all of the energy we expend is wasted. To find a way to capture that energy and make it useful, they developed prototype after prototype and spent hundreds of hours testing their designs. For the best results, charge AMPY in the wall and then maintain the charge with daily activity. Indicator lights show how full it is, and check in with the companion app to see how much energy you’re generating and using. Place AMPY on the part of you that’s moving the most, like legs when walking, or toss it in your bag if you’re hiking. 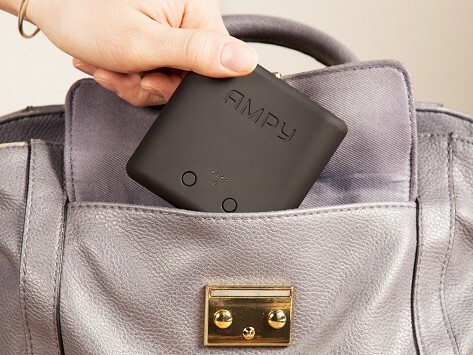 AMPY is a convenient travel or emergency back-up charger, and a great introduction to green energy—completely powered by you.